To be truly free to travel with our babies, a good bag is as essential as a good sling. The Onbag has been designed to use alongside your chosen carrier, enabling you to get out and about. The Onbag is large enough to hold everything you need and, because it has no hard parts, your baby can comfortably sleep on the strap or rest a leg against it. You can wear an Onbag as a rucksack, shoulder or cross-body bag. 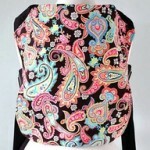 You can even arrange the straps over your baby. The great thing about the Onbag is that, being soft, it lies very flat against your body and looks small when you don’t have much in it – but when you need the space it expands to hold an amazing amount!